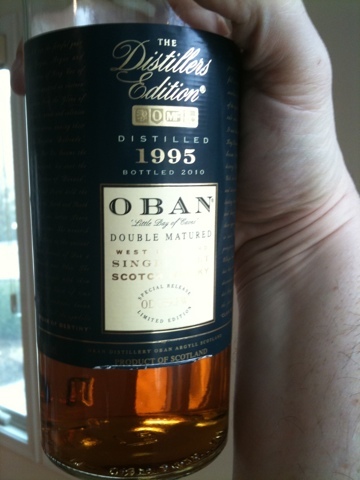 Oban is, along with Talisker, my favorites of Diageo's "Classic Malts Collection". It is a small urban distiller in a small west coastal town on the Scottish mainland at the apex of the triangle formed the where the Scotch whiskey holy grail islands of Islay, Jura, and Mull meet the mainland. It has some of the iodine and brine of these coastal drams, but also some of the grainy sweetness, less peat, and softer water of the Highland drams. There's also a special "old wood in the attic" feel that is uniquely Oban - and it's something I always enjoyed very much. It's an aroma or flavor that I sometimes associate with bones - as in medical specimens. Odd - but such is memory. In the "Distiller's Editions" there's always secondary wood finish and in Oban's case the distiller chose Montilla Fino casks. This is a dry and subtle wine; less of the big grape usually chosen for second fill aging. I suspect they wanted to leave the more subtle aspects of Oban intact and preserve more of its dryer aspects. I used the 1995 edition for this tasting. In the glass Oban is normally a straw golden yellow. The distiller's edition's secondary aging adds a lovely orangey coppery glow. Aromas of black cherry and vinuous resin join the subtle iodine, brine and oats aromas of Oban. I get my "bones in a box" quality at the edges. After extensive air the entry on the palate is sweet grain, which rapidly expands into cake batter, sea brine, white raisins, and turkish delight. Finish is long with hard candy fading into old hatbox wood and a kiss of distant smoke. This is sweet, complex, sophisticated stuff. The more I taste it the more I find in it. There's chocolate in the finish, and nutmeg and apricots in the initial sweetness. It's a rich complex of flavor notes that's hard to pin down. The sweetness and sea brine combo is pure Oban - and this distiller's edition version amps up those strengths. Often with good spirits I find that my first glass is somewhat closed or muted in flavor compared with the middle of the bottle. It's something to do with how the air interacts with the liquor over time. This was especially true of this bottle. The first few glasses seemed excessively dry. I put it on the shelf for a month or so and when I came back it had magically bloomed into something sweet and wonderful. Remember that when a new bottle disappoints you. More air... Sometimes a poor initial showing ends up becoming a favorite selection after the bottle blooms. Remember, this can be a dual edge sword towards the end of the bottle as oxidation robs the final drams of intensity if you wait too long!